A mum-of-five says she's made the drastic decision to pull her children out of school and educate them at home because she can't afford bus fees. Samantha Househam said she has been spending £200 a month on bus trips to pick up three of her children - aged between six and nine - from school. She said the bus fees are so expensive that she cannot afford oil to heat her home. Ms Househam doesn't drive and she hasn't been able to find any other viable way to transport the youngsters between their home and school in Wainfleet, Lincolnshire. The 38-year-old mum told Lincolnshire Live that she is now making plans to take the children out of The Magdalen Church of England/Methodist Primary School. She said: “Because I am having to pay out all this money each week to get my children home from school, it means that we cannot afford oil for heating. It costs Ms Househam £2.70 to make the trip to her children’s school every afternoon, and a further £7 to get the family back to their home in Croft Bank in Skegness. Her two older children get dropped off by her partner in the morning, but have to walk home. Now the mounting costs have convinced Ms Househam home schooling is the answer to her family’s woes. This week, she handed in a letter to the school stating the reasons for her decision. 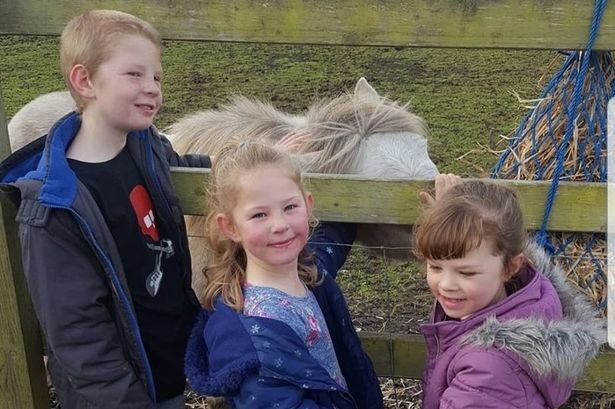 And she thinks it could be liberating for her children – John-Henry, nine, Skye, seven, and Brianna, six – who she says will no longer be stuck behind a desk. She said: “I’m excited and scared but as I have found out, there is loads of advice and groups and support. Ms Househam added: “It is totally different to a school environment and you don't have to stick to the curriculum, which I thought you had to. Ms Househam revealed her intentions in a post asking for advice on Facebook and was showered with support by other mums who gave her advice. John O'Connor, Children's Services Manager with Lincolnshire County Council, said: "Rather than go to the nearest available school, this parent chose to send her children to another school some distance away so they are not entitled to free school transport. "We have explained this to her and are looking into an alternative nearest school for her children. "We have also suggested if she can provide us with any further relevant information we can consider her situation under exceptional circumstances."